Note: This work of mathematical fiction is recommended by Alex for young adults and math majors, math grad students (and maybe even math professors). IMHO When she starts typing away before she realizes that the object in her hand is not a smart phone but a fan, this is not merely a silly joke but a hint that Lovelace had a sense of potential importance of computing machines. The graphic novel includes many actual quotes from these two historical figures and copious footnotes. Then, it takes off in another direction as it considers an alternate universe where their achievements were even greater than they were in this one: they actually build the analytical engine and use it to address various anachronistic problems, from a strangely familiar financial crisis to a 19th century version of auto-correct. Mathematicians William Rowan Hamilton, Charles Dodgson and George Boole make cameo appearances. The laws of physics in this other universe are humorously described on one spread, justifying the black and white images and temporal anomalies in terms of a limitation on information and wobbly Gödelian time-like loops. 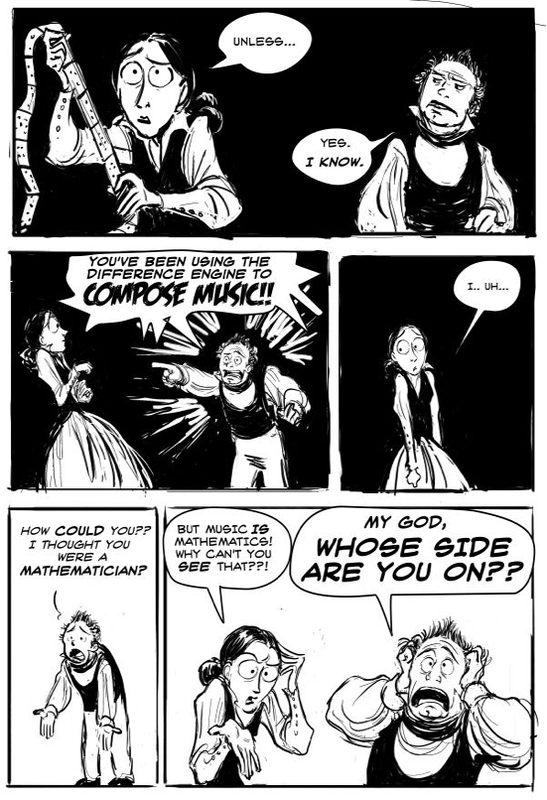 The "E" in the equation "E=mc2" in that pocket universe refers to "Entertainment", and since Lovelace and Babbage are the most entertaining beings in it, they are also the "massiest" (sic). Even though this does not make much sense and Padua admits that she doesn't even fully understand the terminology she is using, I found its "E" value to be very high, indeed. This steam punk graphic novel has won praise from some readers who insist that the author/artist is herself a genius, but received only a tepid review from the New York Times which considered it too silly. Personally, I thought it was fantastic, both entertaining and informative. If, like me, you read this book and still want more, be sure to check out the additional comics and commentary at Padua's Website. First of all, it's kind of uncool that this Webcomic is now available on dead trees. Steam-powered Kindle would rule! Otherwise, I have only the highest praise for "Lovelace&Babbage". The stories are hilarious (the best are the footnotes, like as it were with the late Sir Terry Pratchett) and the author invents only an epsilon (we have to stay mathematically correct). And if she ever invents, the Cosmic Giggle Factor ((c) Robert A. Wilson) regularly runs into an old document in some forgotten newspaper proving her right after all. Yes, ill-willed folks could even claim her humor is scholarly - if you ever saw a scholar drawing comics peppered with a hailstorm of gruesome puns. The author merely changed the fact that Babbages Engines were never built - shame on you, Real Universe. 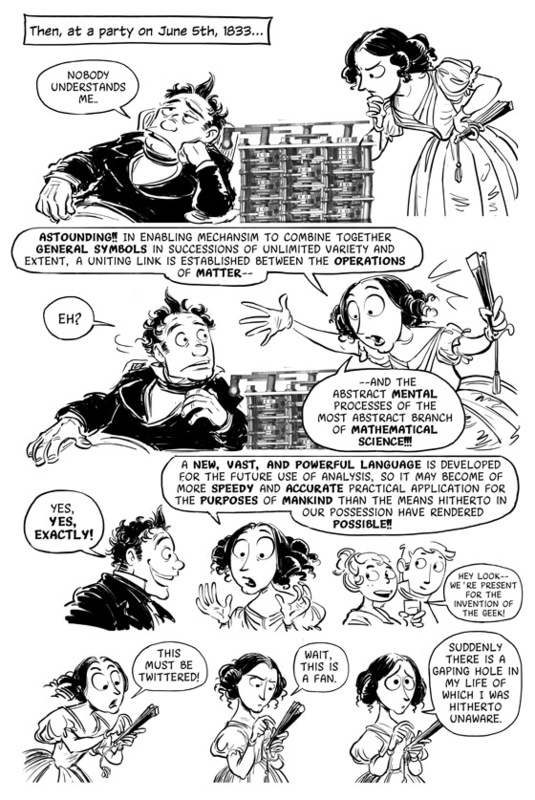 Otherwise historically correct, this semi-hemi-demi-biographically comic features larger-than-life characters, starring Babbage as Slighty Mad Scientist, Lovelace as a Victorian Vampirella (you rarely will find such a strong female lead elsewhere) and cameos of all the science elite, with a special mention of Isambard Kingdom "Why does everybody keeps calling me Wolverine?" Brunel. Strongly recommended.